end up operating the washing machine is because men find it rather daunting to operate a washing machines. 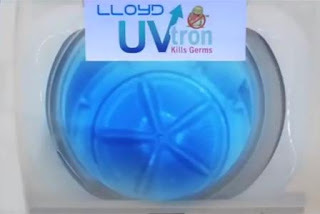 So Lloyd brings a washing machine which uses “UVtron Technology” to kill germs, “Inverter Technology” and is simple to operate — “so easy that sir can do the washing” as the ad says (the ad is embedded at the end of this article). 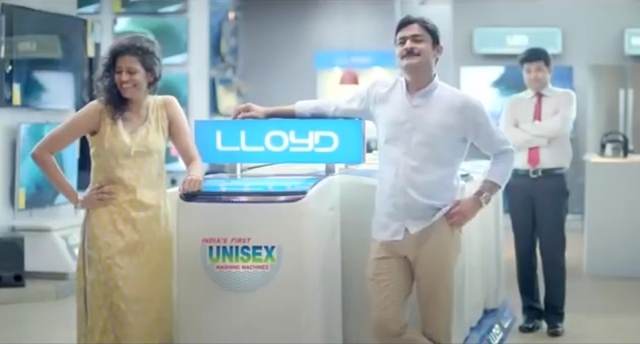 Since Lloyd Washing Machine is so easy to operate even the man of the house can use it. This ad implies that other brands of washing machines are not as easy to operate, especially for the man of the house. From the time washing machines began to be manufactured in India most ads have talked about the technological edge their brand has to wash your clothes better. This Lloyd Washing Machine ad also talks about technology – “UVtron Technology” to kill germs and “Inverter Technology”, though these are not explained. What is “Inverter Technology”? In what way does it help the customer? The ad does not say anything. “UVtron Technology” as the name suggests is surely something to do with ultra-violet rays which is used to kill germs, but who has ever thought of killing germs when washing clothes at home; to my mind this feature is not of much importance in a household, though it might be important in a commercial laundry or a hotel or hospital or some such establishment where clothes of several people are washed all the time. The concept of “Unisex Washing Machine” really means that it is so easy to operate that even the man of the house can wash clothes in it and not just the lady. 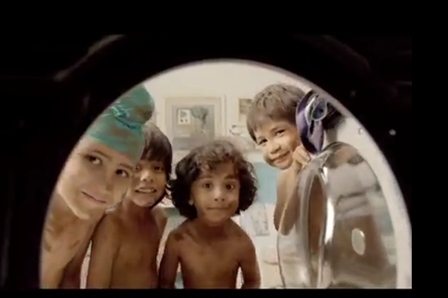 Lloyd is not the first washing machine manufacturer to claim ease of operation; Videocon has already done it, please view the Videocon Washing machine ad showing little kids using it with ease, here is the link. A Whirlpool ad has also shown a married couple together washing clothes, here is the link to the ad. The claim that Lloyd Washing Machine is “unisex” is a gimmick which is supposed to attract customers and direct them to the real proposition which is – Lloyd Washing Machine is very easy to operate, it can even be operated even by the man of the house; this essentially is the message and the ‘competitive edge’, but somehow it does not come out very strongly in the ad. I feel the ad is trying to say too many things in a short time. In comparison, the Videocon ad only focuses on showing children using the washing machine, this clearly demonstrates that the machine very easy to operate. I feel Lloyd Electric & Engineering Ltd. and its ad agency would need to do some fine tuning of their message in their next campaign. Very good blog. Very useful for people who are into washing machine service. Please keep writing more. Thanks.